Planting the rooftops of urbanized areas brings many benefits to public, private, economic and social sectors, as well as to the local and global environments. 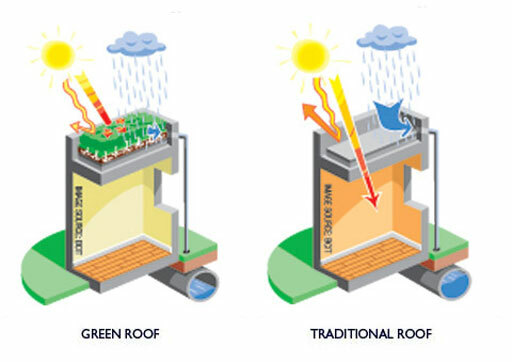 While all green roofs have similar functions, each installation is unique, so technical performance will vary by region, climate, building and green roof type and design. The benefits described below can be achieved by virtually all green roof systems and designs. During heavy or continuous rain, runoff can overwhelm stormwater infrastructure and potentially damage waterways and fish habitat. Green roof growing media retain rainwater and, together with plants, return a portion of this water to the atmosphere through evaporation and transpiration (evapotranspiration). Stormwater that does leave the roof is delayed and reduced in volume. Stormwater that runs off a green roof is cleaner than runoff from a conventional roof. Retention and delay of runoff eases stress on stormwater infrastructure and sewers. Cost savings from decentralized stormwater mitigation reduces the need to expand or renovate related infrastructure. 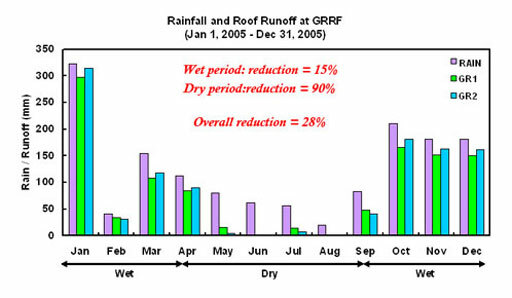 Rainfall and runoff comparison in the 2005 dry and wet seasons (Figure 6 from the September 2006 CMHC Report). Green roofs reduce the heat flux through the roof, and less energy for cooling or heating can lead to significant cost savings. Shading the outer surface of the building envelope has been shown to be more effective than internal insulation. In summer, the green roof protects the building from direct solar heat. In winter, the green roof minimizes heat loss through added insulation on the roof. Energy conservation translates into fewer greenhouse gas emissions. Plant leaves trap dust particles from the air, and evapotranspiration cools ambient temperatures. Less ground level ozone + less heat = less smog. 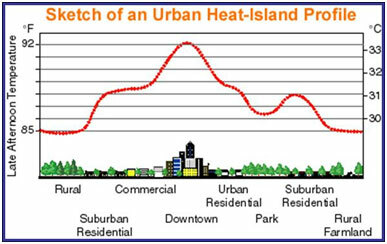 Reduced Urban Heat Island profile. Less need for health care services result in societal cost savings. As undisturbed areas, rooftops can serve as refuge for creatures that struggle for survival. Ground-nesting birds, such as Killdeer, use green roofs for nesting and raising their young. Vegetated rooftop habitats can serve as stepping stones, to create corridors connecting other patches (roofscape or at grade) across an urban sea to natural habitats beyond the city. Natural habitats can serve as templates for green roofs designed for biodiversity. Low maintenance green roofs can be designed to serve as refuge for species such as ground-nesting birds. 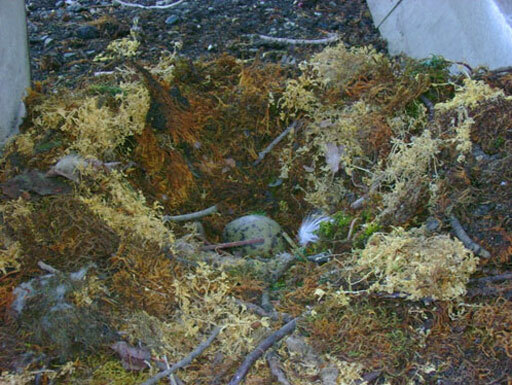 A goose nest on a roof on Granville Island, Vancouver. Green roofs cover the waterproofing membrane, protecting it from UV rays and extreme daily temperature fluctuations. This protection extends the lifespan of the waterproofing twice as long as conventional roofing, meaning that membranes under green roofs last twice as long as those on traditional roofs. Reduced material waste from re-roofing. Less frequent re-roofing, less costs over time. 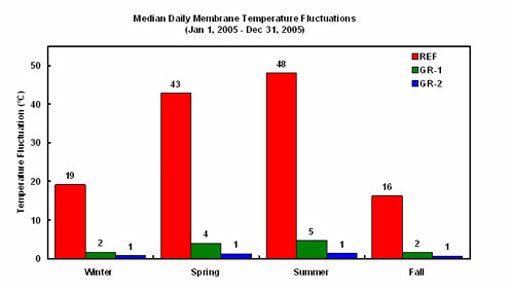 Median daily temperature fluctuation experienced by the roof membrane of the three sections at the Green Roof Research Facility, by season September 2006 CMHC Report). The initial installation cost of a green roof is more than a traditional roof; however, the life cycle cost is competitive. Try out Green Roofs for Healthy Cities’ Green Save Calculator. Green roofs make the most of unused space within the increasing density of our cities. Rooftops can be developed into social and recreational spaces and used for urban agriculture. Amenity space for day care, meetings, and recreation. Improved aesthetic views for neighbours in adjacent buildings. Improved worker productivity and creativity. Potential to enhance urban food security through rooftop gardening and food production. Supply and manufacture of roofing membranes and root repellent layers, drainage layers, landscaping cloth, curbs, irrigation systems and other specialty products. Supply and manufacture of substrate, light-weight soils and amendments, plants. Design and engineering professionals, contractors and landscapers; and companies supplying maintenance contracts. By improving energy efficiency and addressing the “Urban Heat Island Effect”, we can better prepared and adapted to climate change. Hospital patients with natural views require less medication and attention and may be discharged sooner. Opportunities to recycle aggregate and compost. Potential for faster approval process for new projects (e.g. Chicago). Potential for reduced stormwater/ wastewater charges from municipality or utility. Potential to reduce the size of stormwater management ponds or cisterns, resulting in cost savings. Potential for grants related to energy efficiency and/ or green roofs. Potential for density bonusing/ larger floor area ratio (e.g. Portland OR). Potential to score more than 7 credits under the US and Canadian Green Building Council LEED certification system. Potential for satisfying minimum parkland / green space set aside, requirements.